Happy Friday! I hope you have had a lovely week. Death and Daisies by Amanda Flower will be out on November 13 along with A Seat by the Hearth by Amy Clipston and Murder at Harbor Village by G.P. Gardner. 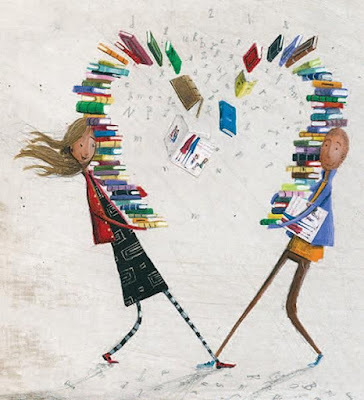 So many delightful books have been published recently and there are not enough hours to read them (or bookshelves to hold them). 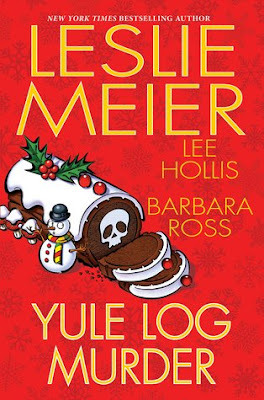 Yule Log Murder contains three short cozy mysteries by Lucy Stone, Barbara Ross and Lee Hollis. 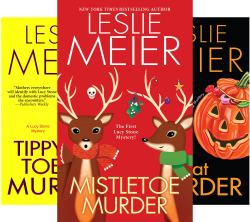 Yule Log Murder by Leslie Meier takes us to Tinker’s Cove, Maine. Lucy is playing an extra in the period film, Guinevere being filmed at Pine Point. Lucy finds it tedious until the cook’s assistant is found dead smothered in pink icing from a yule log and a knife to the stomach. When Phyllis Lundquist’s relative is arrested for the crime, Lucy is tasked with finding the culprit. She must work in her sleuthing in between working at the paper, her role in the film and the final preparations for Christmas. Lucy gets an early Christmas present when her son, Patrick and his family arrive to celebrate the holidays. Surprise turns to shock when she encounters their new pit bull, Skittles and hears their unexpected news. Spending time on the set tracking down a killer sounds like a welcome escape to Lucy. Lee Hollis entertains readers with Death by Yule in Bar Harbor, Maine. Hayley Powell’s holidays are not starting off as planned when her son, Dustin becomes snowed in with his father. Her daughter, Gemma arrives with her new actor boyfriend, Conner who seems too perfect. They attend Liddy’s annual Christmas party which has a significant number of party crashers including local bad boy, Ryan Toledo. After an altercation between Ryan and Conner over Gemma, Ryan is escorted out of the party. A few hours later, Ryan is found in the woods near Liddy’s house with remnants of one of Hayley’s Yule logs on his body. Connor is at the top of the suspect list and a distressed Gemma asks Hayley to clear his name. Which resident of Bar Harbor is getting an orange jumpsuit for Christmas? 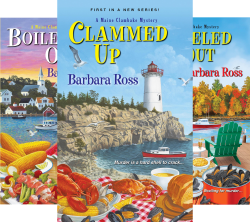 Logged On by Barbara Ross is set in Busman’s Harbor, Maine. 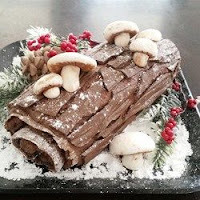 Julia Snowden wants to start her own Christmas tradition and she has decided it will be a Buche de Noel (oh dear). Julia is not going to let the fact she cannot make a decent one stop her. Julia’s mother suggests she consult their crusty neighbor, Mrs. Odile St. Onge. The baking lessons begin, and they give Julia a chance to learn more about the reclusive woman. Julia has noticed that Mrs. St. Onge’s caregiver quit showing up recently along with her grand-nephew which leaves the older woman without assistance. She decides to investigate the matter, and Julia is dismayed when she learns that Mrs. St. Onge has had a few relatives pass away during the holidays after eating her Buche de Noel. The more Julia learns the more alarmed she becomes. Julia is determined to get answers, but she is wary of becoming the next victim. 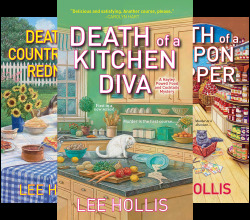 Yule Log Murder contains three entertaining cozy mysteries. While the three tales are part of existing series, you can read them as standalones. I enjoyed visiting some of my favorite characters during the holiday season. Yule logs are woven into each story. While these delectable cakes are beautiful, they are not easy to make. There are friendly characters, charming small towns, holiday cheer and mysteries in each novella. All three are well-written with steady pacing and good flow. I was a little surprised by what is happening with Patrick Stone’s family in Yule Log Murder. They are not as I remember them, and I hope we see significant changes before they appear in the series again (I know I am being vague, but I do not want to spoil it for you). All three mysteries have humor, but I found myself laughing more at Julia’s antics in Logged On. All three crimes can easily be solved, but they are still pleasing to read (I stayed up very late finishing this collection). I am giving Yule Log Murder 4 out of 5 stars. Find yourself a comfy chair to relax in while reading the diverting and merry novellas in Yule Log Murder. Thank you so much for visiting today. What are you currently reading? 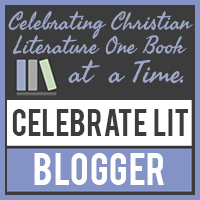 I am always looking for new books and authors (and so is my mother). I will be sharing my review of High Crimes by Libby Fischer Hellmann tomorrow. It is the fifth novel in The Georgia Davis PI series. I hope you have a fulfilling day. I will return tomorrow. Take care and Happy Reading!